Happy Wednesday and August 1st. Where did July go?! I swear it just started. To kick off August on a bright note, I'm very happy to be today's TLC Book Tour stop for America for Beginners, a new debut novel by Leah Franqui. Accompanying my review is a recipe for a simple and tasty Bengali Fish Curry that was inspired by the book. I'll just start with how much I enjoyed this book and Franqui's writing. It's her debut novel which left me a bit surprised at how skillfully she introduced, and had me quickly caring about its three quirky characters. Pival Sengupta recently lost her husband Ram, and is experiencing a bit of freedom from her bad marriage and cruel and verbally abusive husband with a journey from Kolkata, India to New York. Pival's trip is to find out what happened with her son, Rahi, who her husband disowned when he moved to America and then came out as gay. A phone call before his death has Ram abruptly telling Pival that their son has died, and she doesn't quite believe him. She intends to travel cross-country from New York to Los Angeles to find out--if he's alive, she'll bring him back to India and get him back on track, if he is dead, she will join him. Of course Pival doesn't state her reason for coming to America when she books the tour with Ronnie, a Bangladeshi immigrant whose company caters to rich Indians while hiding his background and ethnicity from them. Pival's guide for her trip is Satya, a young Bangladeshi immigrant working for the tour company, who has secrets of his own. For propriety, Ronnie hires a young actress, Rebecca (working several jobs while awaiting her big acting break), to travel with Pival and Satya. The trio goes from New York and Niagara Falls to Philadelphia, Washington DC, New Orleans, Phoenix, Las Vegas and finally, Los Angeles as Pival builds her courage to confront her son and/or the man who "corrupted" him. The trip challenges this unlikely trio in different ways, opening their eyes not just to America but to their own lives, thoughts, assumptions and prejudices. The book alternates the three main characters telling their stories with the story of Pival's son and his partner, and also tour company owner Ronnie's perspective. That Franqui manages these shifting perspectives in a smooth way that allows each character to shine, makes America for Beginners a pleasure to read. It had me smiling, chuckling, shaking my head, and tearing up at this unusual road trip story and I was sorry to see it end. A favorite for July and for the year. 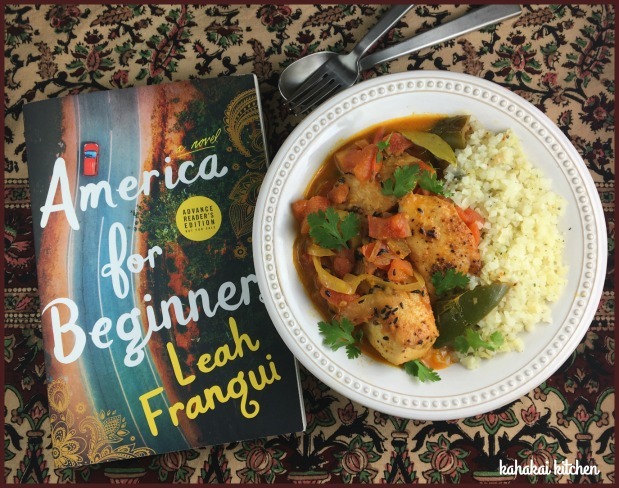 Author Notes: Leah Franqui is a graduate of Yale University and received an MFA at NYU-Tisch. 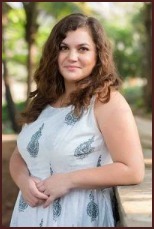 She is a playwright and the recipient of the 2013 Goldberg Playwriting Award, and also wrote a web series for which she received the Alfred Sloan Foundation Screenwriting award (aftereverafterwebseries.com). A Puerto Rican-Jewish Philadelphia native, Franqui lives with her Kolkata-born husband in Mumbai. 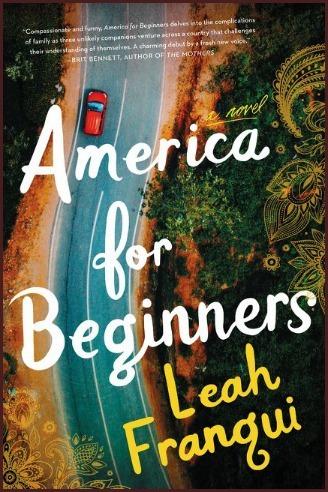 America for Beginners is her first novel. Although much of the food consumed in America for Beginners seems to be mediocre American and/or Bangladeshi-American versions of Indian dishes, there was plenty of food to be found including fish curries, coconut mutton chops, kebabs, dal, naan and roti breads, butter chicken, yogurt, papaya salad, tea and biscuits, Chinese food--including moo shou chicken, sweet bean buns and pork dishes from a noodle house, cheesecake, hot dogs, chicken and rice, popcorn, egg sandwiches with turkey bacon, and "authentic" New York pizza. There was also sushi and tempura, Mexican takeout, chai, Alphonso mangoes, a Thai food dinner of red curry with tofu, veggie spring rolls and veggie pad Thai and white wine, aloo gobi, chicken tikka, omelet with green chiles and garlic, tandori chicken, pasta with cheese, eggs scrambled with lentils, beignets in New Orleans, samosas, rice, oolong tea, croissants, coffee and scones, sag paneer, chana masala, gumbo, spicy corn and mushroom tacos, cold brew coffee, kombucha, and fish baked in mustard. 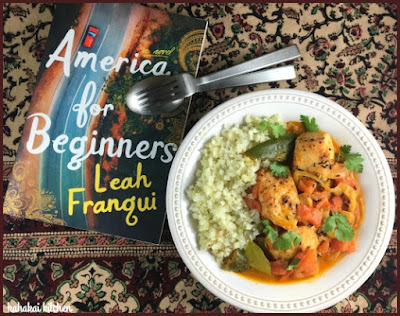 Plenty of dishes would have matched well for the book, but there were several mentions of Bengali fish curries like those that Pival's cook made for her at home in Kolkata--the capital of West Bengal. 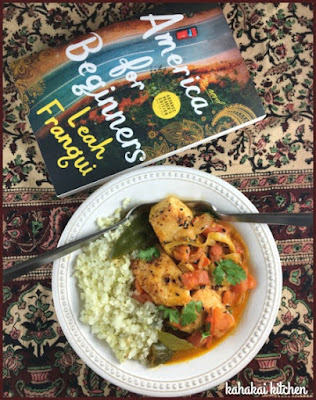 The description of the mustard-scented fish and the mustard oil used had me intrigued and hungry, so I decided to make a Bengali Fish Curry for my book-inspired dish. 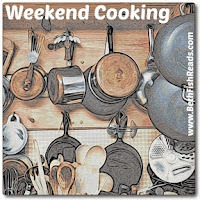 Timing being what it was, I looked online for recipes rather than consulting my Indian cookbooks and found one that sounded both easy and good from the BBC Food website from a show called The Hairy Bikers. How could I resist that show title? Plus, it utilized ingredients I had and didn't make me drive into town for mustard oil from the Indian market--something I just didn't have time for this week. So I won't speculate on how authentic and traditional this recipe is, but it served my purpose well. Speaking of not authentic, I replaced the traditional rice with cauliflower rice--quick and easy from the microwave. Cut the fish fillets into roughly 7cm/3in wide strips. Put in a bowl and toss with the salt, cayenne pepper, half a teaspoon of the mustard powder and lots of freshly ground black pepper. Mix the remaining mustard powder with 300ml/10fl oz water, adding it gradually and stirring constantly until you have thin yellow liquid. Set aside. As soon as the fish is cooked, return the pan to the heat and add both the mustard seeds and cumin seeds. Cook for a few seconds, stirring constantly. Add the sliced onion, chillies and bay leaf. Cook for about five minutes, stirring constantly, until the onion is softened and pale golden-brown. Make sure you cook with the extractor on full-speed as the spices could make you sneeze! Sprinkle over the turmeric and garam masala, add the chopped tomatoes and cook for two minutes more, stirring constantly. Stir in the reserved mustard liquid and bring to a simmer. Cook for three minutes, or until the sauce has thickened and the volume of liquid has reduced by approximately one-third. The spices should have mellowed and the sauce should coat the back of a spoon. Return the fish to the pan and warm through in the bubbling sauce for two minutes until hot. Cooking Notes: This is a light tasting curry but don’t reduce the amount of oil in the recipe as you need it to help thicken the sauce. 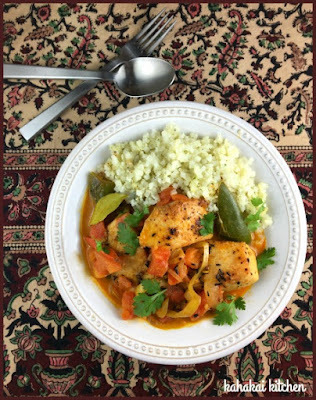 Any fish fillets can be used or make it with fish steaks instead – as they often do in India - but you’ll need to increase the cooking time accordingly. Notes/Results: I really enjoyed this curry--it was spicy but not alarmingly so (I am glad I de-seeded my chili peppers), with lots of flavor and freshness. I liked the mustard flavor in it and how it worked with the cayenne, turmeric and garam masala to make this curry different from many others I have tried. The fish is fried and then warmed back up in the curry before serving--which worked well with the firm kajiki that I used. 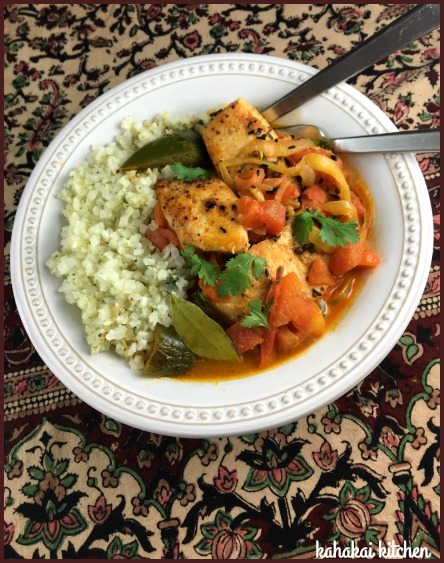 The fish curry went well with the herbed cauliflower rice for a pretty quick and simple dinner. I'm glad I have another serving for tonight and I will happily make this again. 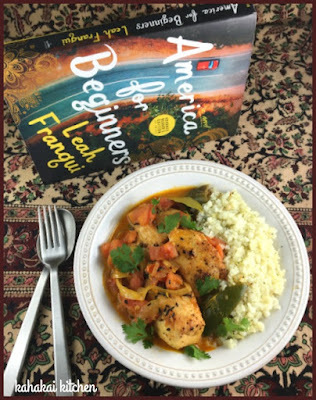 Note: A review copy of "America for Beginners" was provided to me by the author and the publisher, Harper Collins, via TLC Book Tours. I was not compensated for this review and as always, my thoughts and opinions are my own. Good review, sounds interesting! And your fish dish has to be good too! I really liked the book -- and the characters -- too. And fish curry is the PERFECT accompaniment. I've never made it, so I might start with your version. Your descriptions of the fish that are available in Hawaii really make me envious! Whenever I'm in Hawaii I try to buy & cook some fresh local fish even if the condo we rent is pretty bare of equipment and spices. Your flavors for this dish sound great. This looks so good!! And the book sounds interesting too. I do want to read this book. Apparently our state library system has it on order, but not yet available. That curry sounds soooo good, and reminds me of a CTBC selection - The 100 Foot Journey I think it was, with a memorable fish curry that was my inspiration. Thank you for sharing the book and including the recipe. I will look for it! What a cool book and that curry has me drooling!